We primarily rely on System 1 to make most of our decisions. Unfortunately, it often leads us astray and gets us into trouble. The reason it leads us astray is that it relies on rules of thumb that give us a starting point from which to base our decisions. The problem is these rules of thumb can bias our thinking in ways that lead to poor decisions in many instances because we don’t spend adequate time and energy thinking through those decisions. This installment focuses on how you can use the knowledge of cognitive biases to improve your work with fathers. While the number of biases is large, this installment focuses on several of the most common ones you might encounter in your work with fathers. The confirmation bias refers to people’s tendency to seek evidence that supports their current views. People naturally want reassurance that their views are correct. They don’t typically challenge their own views by seeking evidence to disprove them. It’s threatening to people’s sense of whom they are to admit when they’re wrong. That threat makes the confirmation bias one of the most potent cognitive biases in work with fathers because most fathers don’t actively look for evidence that their views might be wrong. If they rely primarily on punishing their children rather than disciplining them, for example, they won’t look for evidence that they should use punishment as a last resort, not a first option. When fathers suffer from the confirmation bias, it can be difficult to introduce new concepts about how to be a good father. Using the punishment versus discipline example once again, fathers can find it difficult to swallow the notion that guiding and teaching their children with effective discipline techniques is more effective, and better for their children’s overall well-being, than taking away cherished privileges or using corporal punishment. The availability bias refers to people’s tendency to recall information that is most readily available. It causes people to overestimate the probability that events will occur. Child abductions and plane crashes, for example, tend to generate lots of coverage in the mass media. As a result, people commonly overestimate the frequency of child abductions and plane crashes. When fathers suffer from the availability bias, it can be difficult to know the accuracy of the information they provide. That difficulty is not caused by a conscious decision on the part of fathers (e.g. they lie) but because they don’t know they might be misled by their most recent experiences. If you ask a father how happy he is in his relationship with the mother of his children, for example, his answer will most likely hinge on the nature of the most recent experiences with her—perhaps even the most recent one—not on the breadth of the experiences with her over the course of the relationship. If the most recent experience was a poor one, he will be more likely to say he is unhappy, and vice versa, than he is. You’ve undoubtedly heard the phrase “hindsight is 20/20,” which refers to our ability to more clearly evaluate a choice after it happens, and know the outcome of that choice, than before we made the choice. The problem with that phrase is it’s misleading. It assumes that we should have known, or did know all along, what would happen even though we could not possibly or accurately predict the outcome. This hindsight bias refers to people’s tendency to create narratives (stories) about past events so they can make sense of unpredictable outcomes. Regardless of how sound decisions made or processes put in place were at the time of the choice, this tendency causes people to more readily blame good decisions and processes related to poor outcomes than give credit to good decisions and processes related to good outcomes, a bias all its own called the outcome bias. In other words, people have difficulty understanding that good decisions and processes can result in unpredictable, poor outcomes just as easily as they can lead to unpredictable, good outcomes. When fathers suffer from the hindsight bias, it can be difficult to help them understand that they are not necessarily to blame (or to blame as much) for specific outcomes. When a father assesses a failed relationship with the mother of his children, for example, he might disproportionately attribute the failure to himself or to her. Perhaps he made mostly good decisions as they tried to work through their issues, but factors beyond his control had a major contribution to the failed relationship. The father may think he knew all along that the relationship was headed to a poor conclusion when he didn’t know and couldn’t have known the outcome. On the other hand, when fathers suffer from this bias they take more credit than they deserve for good outcomes. A father might take more credit for raising a healthy, well-adjusted child, for example, than he gives to the mother. He may say that his firm discipline was the key factor in how his child turned out when many other factors contributed just as much or more. 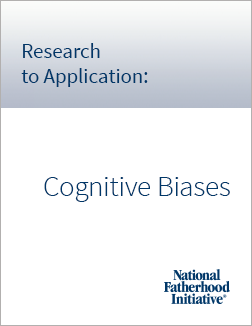 Confirmation Bias: Knowing that many fathers will seek evidence to confirm their existing beliefs, attitudes, and behavior—and that they will resist changing the way they think and behave—better prepares you to work with fathers, especially on challenging topics such as masculinity, child discipline, and healthy relationships (e.g. communication with their spouse or partner). When you help fathers tackle these challenging topics, take extra care to prepare yourself for what can be a long process of change around certain issues. Availability Bias: Knowing that many fathers will rely on recent events and experiences to shape the information they provide can help you broaden your thinking and approach to dig more deeply into what contributes to fathers’ thoughts and feelings. Ask probing questions to determine what fathers use as the foundation (evidence) for the information they provide. If a father says he is unhappy in his relationship with the mother of his children, for example, you can ask questions to determine whether he is narrowly framing his feeling based on a recent experience(s) with her or the breadth of the relationship. If the former, you can challenge him to re-evaluate his feeling based on the breadth of the relationship. Hindsight Bias: Knowing that many fathers will create stories about past events to explain unpredictable outcomes, you could ask them, for example, to create timelines that include the decisions they made and processes they put in place and examine with them how much those decisions and processes contributed to good and bad outcomes. Help them evaluate the quality of the decisions and processes separate from the outcomes. In some cases, they might learn they should not abandon a good tactic to become a better father or partner, for example, just because it didn’t lead to the desired outcome. Help them understand that the good tactic becomes the means and the end—even though the father hopes it will lead to a good outcome—and that it might contribute to a good outcome the next time. Regardless of how you apply the knowledge of cognitive biases, approach your effort as an experiment. Keep track of what works with fathers in general and with specific kinds of fathers (e.g. custodial and non-custodial) so that you can apply what works in future work with fathers one-on-one or in groups, and avoid what doesn’t work. The book Thinking, Fast and Slow by Daniel Kahneman. Click here for the full PDF of the this post. (1) Kahneman, D. (2011). Thinking, Fast and Slow. New York: Farrar, Straus and Giroux. The series offers a platform for generating dialogue among NFI, organizations, and practitioners on ways that research can be applied to addressing pain points in serving fathers. This post is the sixth one in the series. It provides ideas on how you might integrate research on cognitive biases. Integrating this research could make you more effective in your work with fathers (e.g. facilitating a fatherhood program or working with fathers one-on-one).